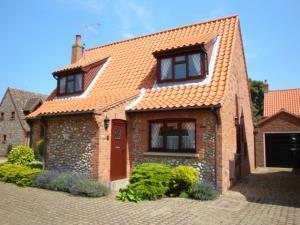 Gabriel Cottage01328 710743work Self-cateringA comfortable well appointed detached house situated in a quiet courtyard yet only a few minutes amble from the shops and quayside of the popular port of Wells with its fishing boats and leisure craft. The town has quaint little streets and inns, restaurants and shops whilst at the harbour entrance, one mile from the quay, is a sandy beach lined with colourful beach huts backed by sand dunes and pine woods. Gabriel Cottage has two bedrooms, each having an adjacent bathroom. The property has full gas central heating and other amenities. Whilst modern, the property is built of reclaimed materials and local flint, consistent with the area of outstanding natural beauty (see pictures on our website www.gabrielcottage.webs.com). The bricks were reclaimed from the demolition of an adjacent maltings and beams in each of the houses in the courtyard show testimony to that building. Gabriel Cottage was cleverly designed so that it could be used as a bungalow for 2 people with the additional bedroom and bathroom facilities for guests accommodated on the first floor. Gabriel Cottage offers weekly bookings starting on Saturday. A comfortable well appointed detached house situated in a quiet courtyard yet only a few minutes amble from the shops and quayside of the popular port of Wells with its fishing boats and leisure craft. The town has quaint little streets and inns, restaurants and shops whilst at the harbour entrance, one mile from the quay, is a sandy beach lined with colourful beach huts backed by sand dunes and pine woods. Visitors comment on the high standard of cleanliness and fresh appearance of the property. Such are the standards that we have returners year on year but still have weeks available for new visitors. To maintain the standards that our visitors have come to love the maximum number of visitors in a party is four and unfortunately we cannot accept children, pets or smokers. No children or pets accepted. Minimum age 21. Broadband speeds of up to 73Mb/s Children welcome from age 21. If guests with limited vision were coming the guest information would be prepared in large print for them. We can adapt to any guest's needs.